Once again, this will be a behind the scenes breakdown of a couple photos from my photos from Camp Hollywood 2014. Shooting at the Miss Camp Hollywood contest had a different set of challenges in the light "setup." For one thing, I don't have any experience with fashion/glamor/vintage photography, so I have to feel my way around as I go. One of the first steps was to choose the camera angle. I like to be close, but I have a lot of equipment so I need to be on the aisle. I arrive about an hour early to stake out a spot. I don't want too many audience heads in my shot and I have a lot of equipment and need space for a battery change or two, and maybe need to swap memory cards. Also, I need to be mobile and possibly grab a second camera. This was outdoors in the middle of the day, which is some of the least flattering light. The sun is close to directly overhead and is effectively its maximum brightness, so there is the maximum contrast between the lit and the shadow areas. With no clouds to diffuse the sun, the sun acts as a point source so the shadows are sharp. If I shoot from (A) and she faces me, the sun casts awkward unflattering shadows under her eyebrows causing a "racoon eyes" look. Also, her head will cast a shadow under her chin ending a little under the base of her neck. Any little turn or arm motion will cast a sharp, high contrast shadow across her body. 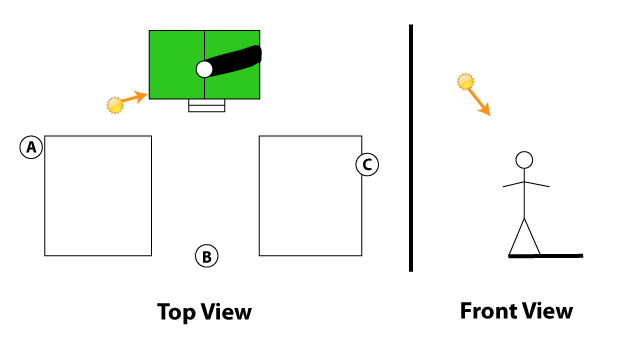 In this setup, the sun is acting as a key. I shot from (A) in 2011 and 2012. Also, if she faces me at (A), she is pretty much looking into the sun and may have an instinct/need to squint. Shooting from (B) will have similar shapes to (A). The light will be coming a little from the side instead of face-on. Some areas of the face may have a more gentle transition into shadow, but the cast shadows under her eyes and chin will still be harsh. In 2010, I shot from somewhere between (B) and (C) and it wasn't too bad. Though I think the stage was at a slightly different angle back then, but I think as long as I was shooting close from the side of the stage, it was a little better than what I drew above. If she faces me at (C), she will be almost entirely in an even shadow. As for the sun, when I am shooting from this side, it acts as a rim light that I find pleasing and helps to separate her from the background. I chose to shoot from (C) because it is really hard to get rid of the shadow shapes in (A) and (B). Also, from (A) and (B), I would be exposing for the sunlit areas, and it may be difficult to recover enough from the shadows. If I used a flash to act as the key, I'm competing with the sun. Shooting from (C), I exposed for the shadows, and my concern is trying to avoid blowing out the lit areas too much. Though I've gone on about there being too much light, I actually did use a fill flash since I was shooting shadow side. I don't remember if I had it on half power or full power, but since I was shooting shadow side, I wanted to fill as much as I could. Really, it had very little impact from my distance, but I like to think every little bit helped. I used a different set of lenses and settings from the indoor work. I primarily shot with an 85mm lens (on a 5D mark 2). This is what I used for all the shots in this post but I'll just mention I also had a 30D with a 24-70mm lens with me for wide shots at the end with all the contestants. From past years, I knew that the 85mm lens could get a full head-to-toe shot when the contestant was on the stage. When she came down walk in front of the judges, she might get close enough to be waist-to-top-of-head, which was still good coverage. Generally, I think of the 85 f/1.8 as a flattering portrait lens. Normally I like to shoot pretty wide aperture indoors, and would normally be pushing this lens at f/2.2, but there was a lot of light(too much light!) outside, and I thought I would like to have a deeper depth of field for beauty shots, so I shot at f/4.0. If I was closer to the stage, I may have even done f/5.6 or f/8. But I was in the second row, right behind the judges, so I think I was as close as I could get. In both of these shots, I had the ISO 100 (which I think is the 5Dmark2's preferred ISO) and the shutter at 1/640 sec, which is faster than what I can use indoors. In choosing these settings, my goal was to expose for the shadow region, but try not to clip the bright spots. Throughout the contest, I remember adjusting the shutter up or down by maybe 2/3 of a stop trying to maintain that balance. I had the display on the back of the camera on histogram mode and every few shots, I would check and confirm that I wasn't blowing out the highlights. In bright sunlight, it's actually difficult to read through the glare on the screen. I want the focus to be on the contestant, but I see a lot of really bright spots in the background - someone in a hammock, the top of the straw hut, and there is the baseball cap in the foreground at the bottom of the screen. The value of the contestant's skin and swimsuit is not significantly different from the background. I know she is obviously the subject of the photo, so I look at her, but the composition of the image is really doing nothing to help me along. Karen(on the left), is facing slightly away from me, so her shoulder gets the direct sunlight, making a sharp shadow. But most of her is in shadow, and the light is slightly rim-like. The sun-as-rim is more successful on Nikki (on the right). She is mostly in shadow(which is what I wanted). I will plan to process the contestant separately from the background with the adjustment brush. First, I want to flatten the background, removing bright distractions. I actually went through about a quarter of the Miss Camp H shots using the Adjustment brush on the background to take down the highlights on the straw roof, the white shirts in the background, the hat in the foreground, etc. I found that I was painting most of the background, and that I needed too many brushstrokes when the background bright spots got close to the contestants, and when I was painting down a bright spot and brightening the contestant, I would get artifacts when the mattes/masks on both sides weren't completely clean. Using the Adjustment Brush on the background was extremely time consuming and required too much fine grained precision on both the background and contestant mattes/masks at the edges. Instead, I tried applying the flattening adjustments to the entire image. For now, this would dull the entire image, but I knew I would come back later with the Adjustment Brush on the contestants. And this allowed me to paint slightly sloppier on the contestants, which was a time saver. First, the biggest impact is generally value, so I'll look at that first. Now I need to think about the overall look of the background. I want to even it out a bit so there aren't major hot spots or dark areas, so I will take down the highlights and raise the shadows. If anything, I want the background darker overall. The saturated green from the grass and the leaves pulls focus a little bit, so I'll desaturate everything a bit. I didn't have a whole lot of reason behind this part, but I had some idea that I wanted everything to have a little bit of a soft glow, including the contestant. I tried to go in this direction by bumping down the overall clarity. For both skin and non-skin, I wanted to push the brightness to make her stand out, so I raised the Exposure by about 2/3 of a stop. Also, I wanted to restore Saturation, but to different degrees. For her skin, I wanted to reduce the contrast between the sunlit and shadow areas so I lifted the Shadow areas a lot (+55) and reduced the Highlights a little more (-20). The sunlight was still more than bright enough to act as a rim light. I wanted to maintain the softness from the previous step (clarity), but restore just a little bit of Clarity to contrast the softness of the background. I wanted to restore the color to her skin, so I brought back the Saturation +23 to undo what I did for the background. I don't think there's a direct relationship with Sat +20 undoing Sat -20, so I need to do it by eye and just decide what feels right (at the extreme, if you remove all the color with Sat -100, I don't think you can get any back by adding Saturation with the Adjustment Brush). Also, I found raising the Color Temperature +15 (warming) felt right. I could use the unprocessed image as a guideline to decide what direction to go. For her swimsuit and hair, I didn't worry about softness and actually wanted to emphasize detail, so I cranked up Contrast, Clarity, and Saturation. I kept he mask for her skin pretty tight. I'm lifting the shadows a lot and was worried about spilling onto the building, but I could be pretty loose with the non-skin mask. For Karen, the process was about the same with slightly different settings. There were a couple more things to address. The microphone drop was a fun moment, and I wanted to emphasize the microphone. Really, the main thing was to find ways to make it darker to contrast against the light umbrella. I tried exporting the photo to jpg once and I felt like the sunlight on her skin was still a little too bright, so I tried to pull down the highlights just a little more. Now, there are fewer distractions in the background. Lifting the shadows made the contestants the brightest part of the image and lessened the contrast with the sunlight. Unfortunately, I couldn't really do anything to address the sharp quality of the shadows on Karen, but on Nikki, the sun worked nicely as a rim light. In the next post, I'll wrap up my Camp Hollywood 2014 notes by discussing more of the process and logistics behind editing a large group of photos and maybe some notes about what I need to work on. Hello, I understand your post. Thank you for share! This information is very useful. I tried to edit the object with https://macphun.com/. It is convenient and very fast. There is a video tutorial as a guidebook.